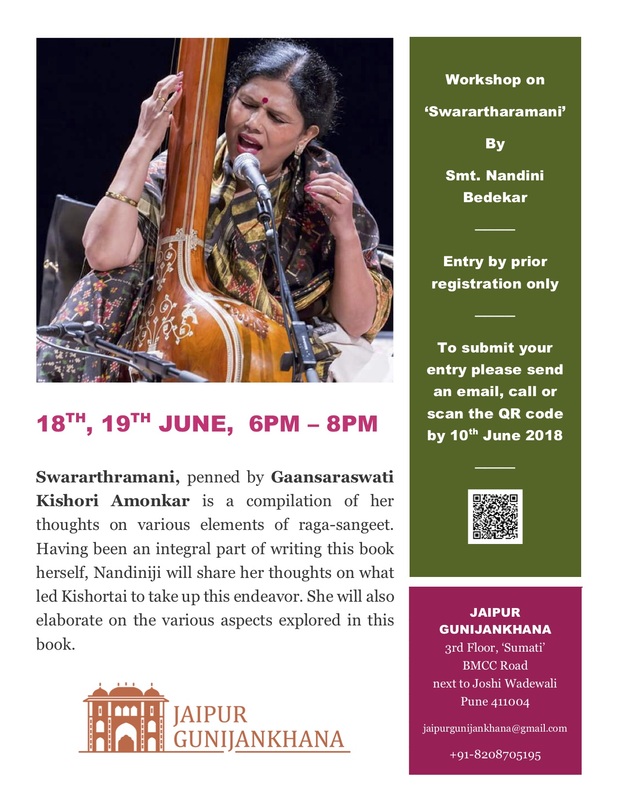 Jaipur Gunijankhana had curated the idea of hosting a two day seminar on the popular book “Swarartharamani” authored by the legendary Ganasaraswati Kishori Amonkar herself. The seminar featured the artiste – Smt. Nandini Bedekar – who had been Kishoritai’s disciple for a period spanning over twenty years. The seminar was initiated to cover the crux of the said book and to enlighten the students of music about Kishoritai’s ideology behind authoring it, with the intention that many students and learners might take advantage of this great learning opportunity. Since Nandinitai had seen Kishoritai from close quarters and had played a vital role in bringing “Swarartharamani” to life, it was a great privilege for everyone to listen to her. The two day seminar began with why kishoritai thought of penning down swarartharamani, her idea behind “raag-ras siddhant”, what going to the root of the raag in search of the “raga bhava” meant to her, why she didn’t stop at just being THE ‘ganasaraswati’ and thought of going beyond it. Nandinitai also gave demonstrations through some ragas, on Kishoritai’s way of approaching the raag bhaav which the listeners got to learn about. The basis on which the “raag bhaav” was classified, Kishoritai’s principles, her theory of “raag ras siddhant” were discussed. Day two of the seminar was mainly focused on the “raag natya” chapter of the book. Nandinitai herself had contributed to the chapter through her extensive research, skill of filtering out the content and putting it into apt words. A question-answer session was followed by it. The audience was receptive and discerning. Dignitaries like Pt. Raghunandan Panshikar, Smt. Manjiri Asanare Kelkar were present. The two day workshop ended with paying homage to the late Ganasaraswati for her invaluable contribution in the field of Hindustani Raag Sangeet.